Note: all data was current as of 3 PM CST on 3/24/19, unless otherwise noted. As with at least a handful of certain names for the Rangers the past few seasons, Brett Howden doesn’t necessarily look out of place when on the ice. Physically he has the tools; he’s a decent to good skater who appears to be giving max effort. Partially because of this (and his on-ice shot percentage spike from games 5 to 20), he became one of David Quinn’s favorite young forwards, peaking with consistent top six minutes between games 15 and 25. He produced in this time, scoring four goals and nine assists during the months of October and November. The season-long results for the soon to be 21-year-old, however, have not been as good as his effort appears to be. Simply put, when Howden has been on the ice for the Rangers this season, they have been consistently out-shot and out-chanced to a significant degree. Due to this, I wanted to explore what are the true weak points of Howden’s results so far, as it certainly seems the Rangers (and many fans) are already penciling him in as a bottom-six center heading into next fall. The above chart hits on my “simply put” sentence from above. The gap in those shot metrics are some of the worst in the NHL for forwards, as Howden has brought the Rangers down from a below-average team to a historically bad NHL team when on the ice. The main problem seems to be shots and chances against, not necessarily in generating shots and chances for. What the above chart means is pretty simple: when Howden is on the ice, shots and chances against the Rangers go way up. You can see the negative numbers for shots and chances for aren’t as stark, which means he’s at least generating somewhat similarly to his teammates when it comes to shots and chances for. At 20 years old, this isn’t particularly shocking that he’s struggling with playing defense in the NHL. That said, there are a sample of peers that have not struggled to these kinds of depths. There have been 44 NHL Rookie forwards to have played more than 300 minutes (28 or more games played) this season. In the “against” categories of the chart above, Howden ranks last of those 44 players in all of them (via Natural Stat Trick). For some positive perspective, however, sometimes these rough first seasons happen, as there are plenty of good forwards who had struggles relative to their teammates in their rookie seasons in the modern era (since 2007). Since returning to the lineup around game 60 after injury, Howden has increasingly began to see more ice time. Generally speaking, players who play more tend to play against higher TOI competition, most of whom are better NHL players. While it is a bit of a crude exercise, Howden has generally done better when he plays down the lineup in a 3rd or 4th line center role at 5v5. In the first chart, you can see that when he receives less than his average TOI thus far (about 11:40 per game at 5v5), his metrics all improve. The caveat comes with the second chart, as he improves his metrics by generating more shots and chances while on the ice instead of limiting them. This makes intuitive sense, because if he’s playing less in a game at 5v5, he’s likely playing lesser-TOI opponents as well (over the course of time). He can generate more offense against worse players, which is encouraging, but the fact that he still can’t limit the shots and chances against is still concerning. To be perfectly clear: all of this is not to say that Howden shouldn’t be an NHL player. He could’ve potentially benefitted from more time in the AHL this season to develop his defensive game, but all of his NHLe (NHL Equivalency) figures indicate that Howden should be an NHL player. The issue here is that in order for Howden to reach his two-way potential, he must progress next season (or ASAP) in being better at protecting the house, aka the high-danger areas in front of his own net. Above visual is available via Byron Bader. In the end, how Brett Howden will be used starting next season will deservedly draw interest. Due to his tools, Quinn & co. will likely continue to give him chances to determine what he can do with his lauded two-way ability. One area that now seems clear to see success will be a significant improvement in his ability to suppress shots and chances against. Teammates can help in that matter, of course, but as a center a large part of that falls on Howden. "Brett Howden Must Protect the House", 5 out of 5 based on 4 ratings. Thanks for this analysis. As always very thorough and clear, and my favorite Rangers-related posts. I think one of the big issues with the Rangers right now is that two of their big young horses, Lias and Howden, had low-key horrible years. Now they are both young and may end up being serviceable NHLers, but if either end up being middle-six guys (think Name), we will be lucky. Their lack of upside could also impact how the Rangers deploy Chytil (wing or center?) and even Kravtsov (he played center when he was younger before shifting to the wing, and then saw some center this year as well). I think Howden is a good young talent who needs more time to develop his game. He came into the league as a surprise and had a lot of adrenaline his first 3 weeks. He then came back to Earth and reached his final level. I agree a 3rd or 4th line center is where he needs to be. Our problem is since the departure of Hayes, we lead the league in 3rd and 4th line centers. Someone needs to step up and be a real 2nd line center. Maybe it is because we need to surround the 2C with real talent on the wing, I do not know. If you take Howden, Chytil or even dare I say Lias, make them a 2C with the likes of Panarin and (if the hype is correct), Kraftsov, and maybe they can be a real 2C. Next year is only 7 months away. I believe that Howden has all the skills to be a very good 4th line center next season, and could eventually be a solid 3rd line center in the future. He was forced into the 3rd line position because of the team’s needs, but being forced that way may have cost him some development, which shouldn’t be a problem down the road. With additional skilled players coming up, or possibly being drafted, next years center line up will be Zib, Chytil, Andersson, and Howden. All very young, and they will grow together and become a core of good players. Kratstov will be very good, Buch will be better than this year, Lemiuxe will make a name for himself on the third line, Boo, along with Fast will anchor a fourth line that can shut people down, and chip in some scoring. 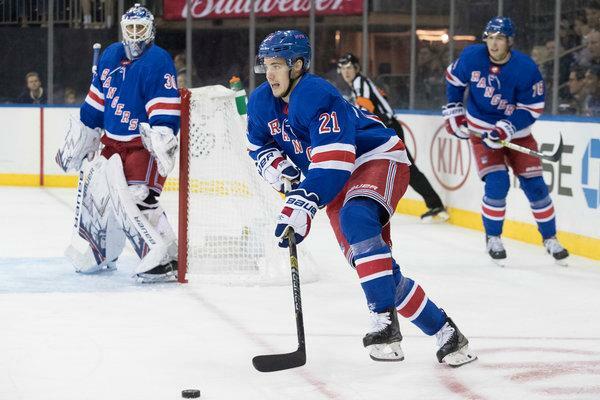 Yesterday someone said the Rangers were rsigning Zucc next season, not sure that’s true, but he could be the veteran leader of this team, along with Kreider, so our forward will be solid. The issue again next season will be defense. Two of the three, Hajek, Lindgren, or Rykov will make this team. That in and of itself will be a vast improvement, and we could see Shatty gone at the draft, along with possibly Smith. Staal will be the hold over pylon of the defense, but if anything he is a proven veteran, and is liked in the locker room, so all isn’t bad. Bottom line, we may make the PO’s next season with the above line up, including Strome, and Name, assuming we don’t sign any UFA’s. Things will look brighter next season!!!!!!!! Howden is what happens when we rush a prospect into the NHL who is just an average player. He will be average for years to come until he learns to play hard every shift with two-way hockey. On a team void of talent, we didn’t have too much choice. I am guessing next year the competition for 3rd line center is between the horror show we know as Lias Andersson and the disappearing act known as Howden. This team needs top 6 talent in a big way and hopefully we get some soon. On the defensive side of the ice, we will have another issue with youngsters who we put into the lineup. While they will be better than the all S team (Shatty, Smith, Staal and Skjei) they will also require a learning curve. Howden is a typical Ranger player – more hype than real top 6 talent. This is why we will need at least 2 more years for our kids to develop into top 6 talent. I think the problem we continue to have is that we are superstar starved and we attach our hopes to average players who we want to be great, but they are really just good. You need really good players on any team, but without a few more superstars, we will continue to be on the outside of the playoffs. Howden will eventually increase his stamina and ability to play 2 way hockey, I have no doubt. Two things that seem to be missing in those stats are any mention of who his linemates were, and any analysis of the quality of the opposition he faced. He frequently seems to be on the ice in a checking role, with other young players, and gets taken advantage of by skilled opponents. He’s a hard working kid, with an upside, but he may need a lot more work to reach the NHL level. FYI: Leatherneck, Mancunian Candidate, and King Sieveqvist have all been banned. The comment thread in the mailbag from this weekend has been deleted. I have repeatedly warned the three of them. I have no problem with opinions and disagreements. But that thread was childish. Three grown men (I’m assuming here) acting in that way have no place here. You make a very good case for the simple statement that Howden was a relatively poor NHL player this year, the sort of player who either belongs in the AHL or a bottom six player on a bad team. Of course, at 20, he has time to grow and those who are better at scouting than I am may predict whether that will happen. Two comments about these stats: Traditional +/- pegs Howden at -15, which is pretty bad for his ice time and role. +/- is more prone to sample size error than possession stats, but the fact that all numbers tell the same story suggests that it is a true picture. My second comment is really a question. Parsing possession stats may suggest not just that a player is bad, but how he is bad. And it may be that historically certain weaknesses among young players tend to be overcome and others tend not to be overcome. Have there been any advances here? Ray – I like your last comments/question but to your point I don’t know if there is a way to directly answer it. My only overarching thought is that there is a reason why aging curves hold true. What I mean by that is younger players tend to have better results until their 25-27 year age seasons, at which point they peak/plateau and begin to decline. Like I tried to state in the article: I don’t think Howden is actually this bad, but his ceiling may be lower than what most think, given the disparity in his results compared to forwards in his peer group. Younger players have better numbers because those who makes the show prior to age 21 are superior talent, so it queers out the sample. Sort of like all those AHL records getting set for U20 production when the pool is <10 players. Zibanejad is -12 in a top 6 role and in his prime. This is why +/- is a garbage stat unless used in the context of teammates. The NHL is a tough league. The players are the best in the world, big and fast. Howden shows promise but it is going to take time. Lias Andersson has had a harder time adjusting to the NHL from Frolunda than it seems the Rangers anticipated, but shows signs of getting more comfortable in the NHL game. The same goes for Chytil and even Buchevich. I imagine a lanky kid like Kravstov would find the transition challenging initially too. Fortunately these are young players and they have time to learn and grow both physicially and in their knowledge of the game. Unless their names are Conner McDavid or Auston Matthews, such growing pains are to be expected. I want a Conner McDavid type of rookie. Someone who lights it up and continues to be top 10 in the league. Problem is there are probably only a few per draft and we ain’t getting one without lots of luck. Is it too much to ask? Agree Peter – just looking at the Bolts – Kuch had 18 points his first full season (52 games) and Point was in and out of the lineup his first year, and that’s with the talent they already had around them. I remember when Scheifle was being talked about as a career minor leaguer and trade bait – it took him 4 years. There is gonna be a time to deliver, but right now growing pains was the key word ever since training camp so we gotta be fair – patience is still key for this year. The league is littered with mid to late first round picks that are merely serviceable NHL players. Hopefully Howden becomes more than that, there’s still time. It’s consistent with everything this tram has tried to do: consistently compete, learn the system, but be good enough to lose. A solid A on execution of the plan. DQ did not distribute the tough love equally. That said Howden will be ok, let him go through the process before throwing him under the bus … same for Lias. We’ve seen how good Howden can be earlier in the season, we’ve seen how bad he can be. The true Howden will probably reveal himself in a couple of years. We have to stop having unrealistic expectations for 20 year olds and wait until they are 23 or so to judge how serviceable they will be through their prime years.